It's time to start getting organized for your April Come Follow Me Lessons! As you know - each month I release a printable Bulletin Board Kit, Activity Sheets, Handout Tags and FREE Textable Images that go with each weekly lesson! 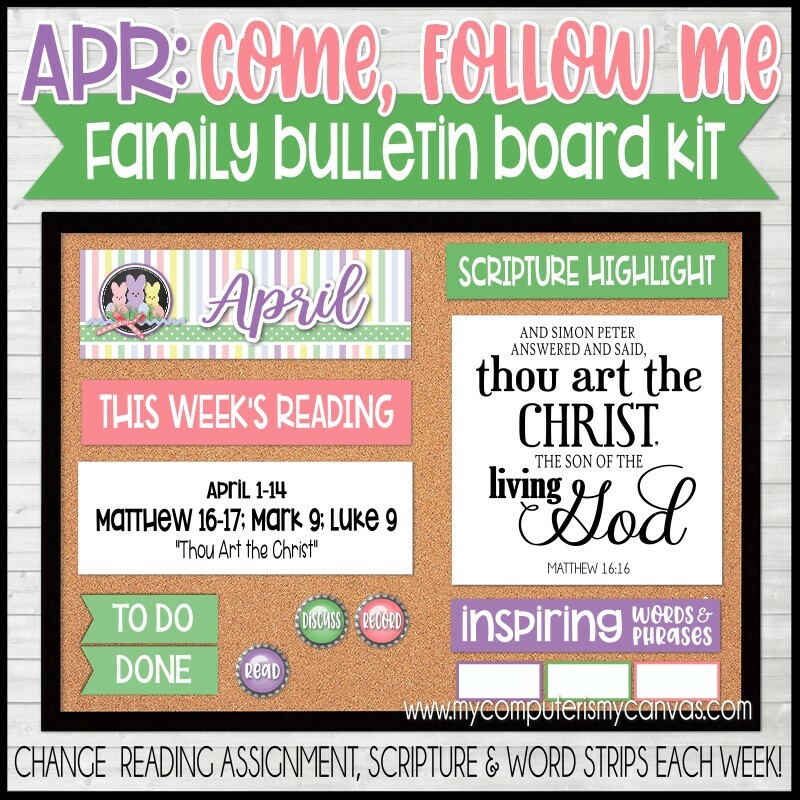 My bulletin board kits can be ordered one of two ways... in PRE-ORDER Discounted Bundles or individually. Each kit comes with a weekly reading assignment reminder, a scripture highlight and new word strips for family members to choose a word that pops out to them each week. Every month the colors change to match the holiday/season making it a fun focal point for family members to follow along. Instructions/tips are included with the printable; works well with a standard 17x23 framed cork, magnet or bulletin board (found at big box and office stores). Another way to reinforce the lesson topics each week is with an Activity Sheet! 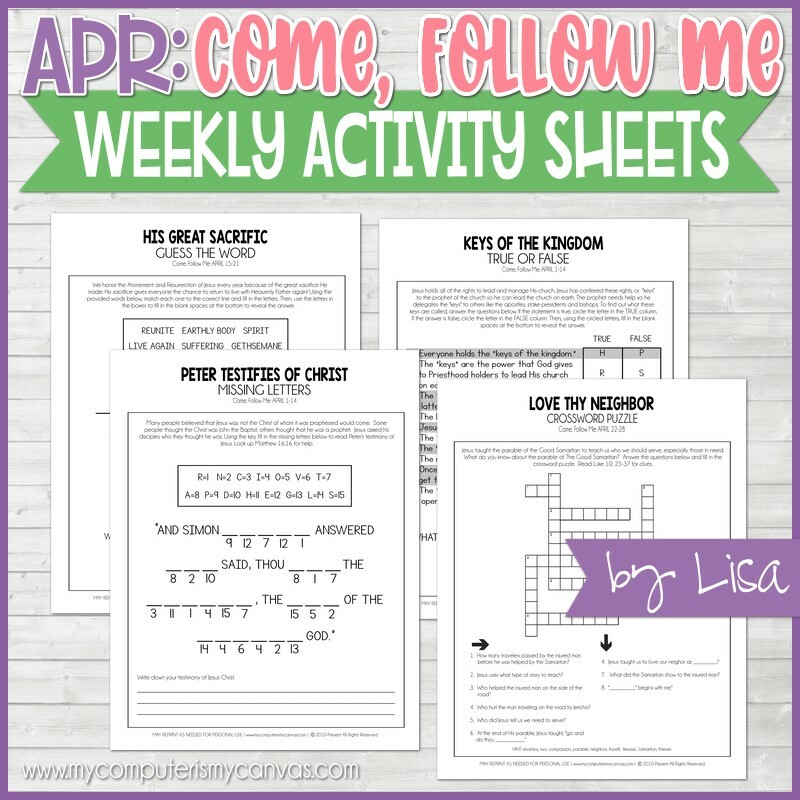 Each monthly kit comes with one activity per week and it makes a great addition or supplement to your lesson. These games are great for ages 7 to 8 and UP... younger kids and non-readers can be paired up with other family members to complete their weekly puzzle! These might be a great option for Primary lessons as well if you need to fill a couple of minutes at the end or want to send them home with something. Another fun way to induce more topic chatter throughout the week is with a fun candy gram or handout! 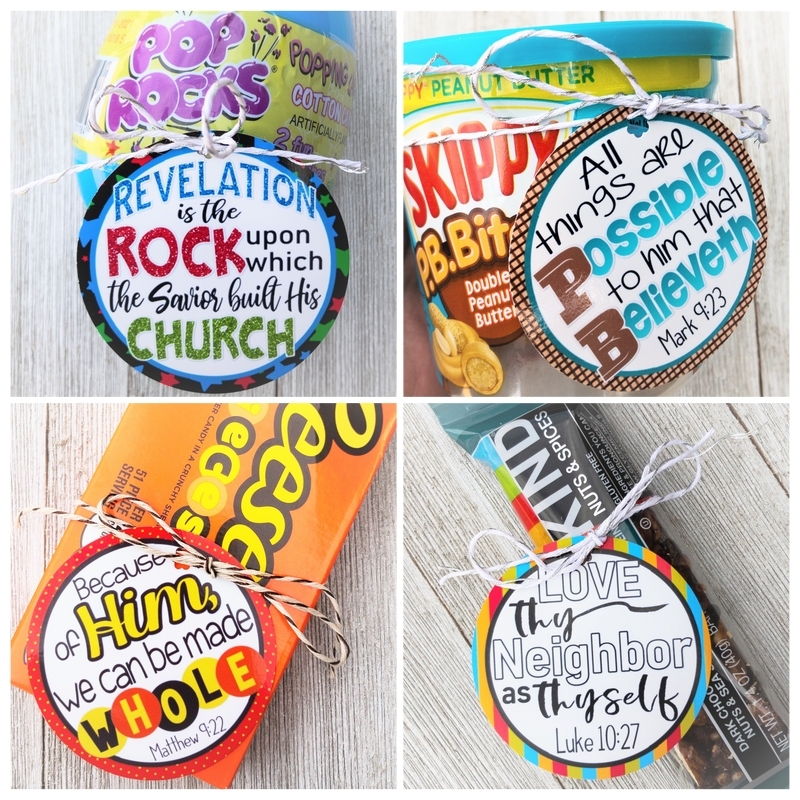 Each week there is one tag that coordinates with a topic, principle or scripture from the lesson. Some tags might have more than one candy option, we'll give you extra suggestions that will match - or come up with your own! If you've been collecting this fun freebie every month... you already know each week comes with three images... a reading assignment reminder, a scripture highlight that mirrors the one on your bulletin board + a second scripture and question to ponder. It's a great way to stay connected with your family throughout the week - particularly with teens, college kids living away or even your married kids or grandkids! These are great for emails, newsletters, youth, Facebook pages, sharing on IG and more! Of course... 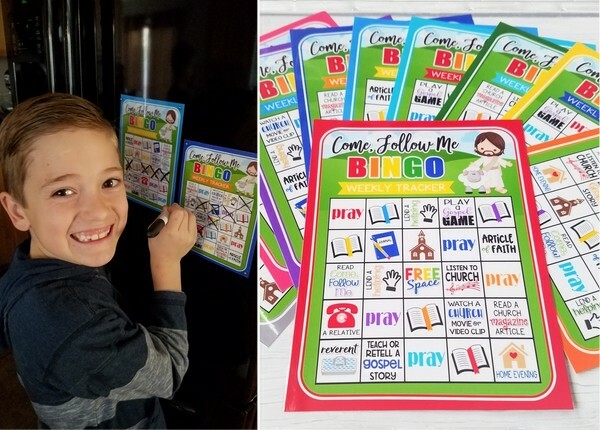 I have a few other things like weekly BINGO TASK TRACKERS, NEW DISCUSSION CARDS and Journals to help keep your Come Follow Me experience fun, engaging and organized! * Buy 2 or more Come Follow Me Printables and use CFMBUNDLE to save 25%! Not valid on Pre-Order Bundles, those are already discounted 25%. Never miss a new release, a freebie, a fun announcement or a coupon! Your email will never be shared, sold or used for any other purpose. Promise! As a thank you... watch for a special coupon after you register! My printables are for Personal Use only; however, they can also be physically printed and made up for gifts, handouts and not for profit fundraisers. A print release is provided on your receipt (a copy clerk may ask). No reselling (digital or physical). See full terms HERE.